Don’t miss the chance to see these amazing artworks! Pearl Lam Galleries is delighted to present Acts of Transgression, featuring works by nine contemporary artists: Andy Dewantoro (b. 1973), Inci Eviner (b. 1956), Ren Ri (b. 1984), Carlos Rolón/Dzine (b. 1970), Yinka Shonibare MBE (b. 1962), Sinta Tantra (b. 1979), Thukral & Tagra (b. 1976 & b. 1979), Joana Vasconcelos (b. 1971), and John Young (b. 1956). Transgression suggests the action of going beyond a set limit or boundary. This group exhibition gathers nine artists who reveal the otherness of their identities and convey a collective desire for transcendence and empowerment in a variety of mediums and artistic languages. Each exhibiting artist transcends established narratives related to diverse subjects such as culture, identity, material, technology, and way of viewing art. Creating a dialogue among these artists, the exhibition engages audiences on multiple levels in the hope that they too will experience the breaking down of boundaries. British-Nigerian artist Yinka Shonibare has become well known for his exploration of colonialism and post-colonialism within the contemporary context of globalization. 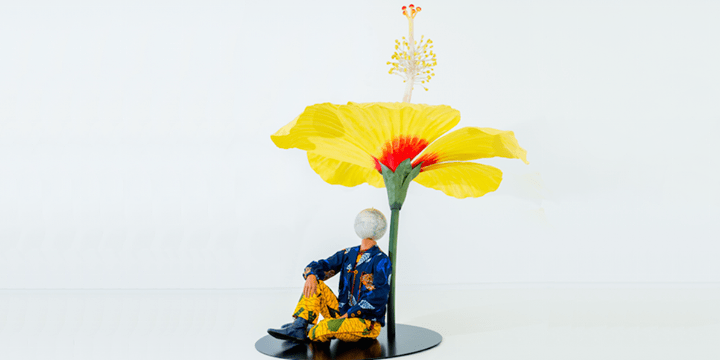 Boy Sitting Next to Hibiscus Flower, the centrepiece of the exhibition, is a life-sized sculpture of an aristocrat dressed in elaborate Victorian batik fabric—a material that originated in Southeast Asia before being sold by the Dutch to their African colonies. The sculpture draws on surrealism as both an artistic and political movement aimed at the liberation of the human being from the constraints of capitalism, the state, and the cultural forces that limit the reign of the imagination. During an artist residency in Europe, Indonesian artist Andy Dewantoro became inspired by 19th century Romantic landscapes. Expanding his colour palette beyond his earlier monochromatic works, the artist’s two recent paintings are bright and earthy, while maintaining his focus on the landscape. His paintings combine urban elements and the natural environment decidedly void of human presence, heightening the sense of drama they evoke. Dewantoro is intrigued by how urban landscapes are able to shape the identity of a city more than the characters of its inhabitants. Born to a Puerto Rican family and raised in Chicago, Carlos Rolón bore witness to the ways in which first generation immigrants adapted to new American middle-class lifestyles. These families brought the diaspora into homes by decorating walls and furniture with exotic colours, textures, and patterns to create a sense of identity, comfort, and, ultimately, an aspirational lifestyle. It is from vernacular and pop culture that Rolón’s present characteristic incorporation of custom culture, faux luxury, and excessiveness originate. The artist is unique in his ability to dissolve barriers between artistic disciplines. Chinese Australian artist John Young melds contemporary technology with oil painting techniques to create art that engages with the anachronistic condition of painting in the age of photography. In his Storm Resurrection series, the artist manipulates original paintings by the members of the Storm Society, China’s first modern art association, to generate abstract compositions. He searches for a historical significance that has somehow escaped the cultural consciousness of artists in China, as he tries to rediscover the country’s source of Modernism. Chinese artist Ren Ri’s stunning geometrical sculptures document his intimate experience with bees as both an artist and a beekeeper. He manipulates the movement of bees and the formation of honeycombs to create metaphysical and hybrid sculptures, which investigate the force of nature and consequences of human intervention. The organic works embody a new belief system, one that symbolizes new metaphysical qualities and forms of life itself. British-Indonesian artist Sinta Tantra’s vibrant geometric paintings explore the concept of “dimensions” through the use of colour and shapes. Her works define the clarity between the two but also finds endless ways of distorting it, questioning the relationship between painting and architecture. By referring to art history, Tantra draws upon a bold and vibrant palette on an architectural scale, exposing the “architecture” of painting on raw linen. Portuguese artist Joana Vasconcelos’s wall-mounted sculpture Florence Nightingale offers us a complicit vision, but one that is at the same time critical of contemporary society and the several features that serve the enunciations of collective identity, especially those that concern the status of women, class distinction, or national identity. Her crocheted piece is a way to go back in time and discover history and craft while finding her own identity. With an emphasis on empowerment, Turkish artist Inci Eviner’s works explore the action of continuity and repetition of strange and unsettling movements performed by men, women, genderless humans, and even hybrid human-animal beasts. The flux of a Turkish identity, continuously shaped and reshaped by movements since the 1980s reflects the East-West paradox of the nation’s geographical location. Eviner’s video installation Runaway Girls depicts “girls” who are in restless action, even though the promise of a brighter future is not guaranteed in a circular concept of time. Blurring the lines between fine art and popular culture, Indian artists Thukral & Tagra probe the very authority that curates art in spectacular and repeated regular intervals, reviewing the profundity of the world in a discursive manner. With playful humour and game culture, the works comment on the globalization of consumer culture and its repercussions, which are being experienced in India today.